Insolvency is postponed for two years, but changes are still needed, federal officials say. Medicare’s long-term health is starting to look a little better, the government said Friday, but both Social Security and Medicare are still wobbling toward insolvency within two decades if Congress and the president don’t find a way to shore up the trust funds established to take care of older Americans. Medicare’s giant fund for inpatient care will be exhausted in 2026, two years later than estimated last year, while Social Security’s projected insolvency in 2033 remains unchanged, the government reported. An overall slowdown in health care spending is helping Medicare. Spending cuts in President Obama’s health care law are also having a positive impact on the balance sheet, but they may prove politically unsustainable over the long run. The relatively good news about two programs that provide a foundation of economic security for nearly every American family is a respite, not a free pass. Program trustees urged lawmakers anew to seize a current opportunity and make long-term changes to improve finances. Action now would be far less jarring than having to hit the brakes at the edge of a fiscal cliff. Politically, however, Friday’s positive report and the absence of a crisis could make legislative action less likely, especially in light of the lack of trust between Obama and Republicans in Congress. No end is in sight for the partisan standoff over what to do about Social Security and Medicare, two of the government’s costliest programs, and the mammoth budget deficits they help fuel. Still, fresh warnings were sounded. “Under current law, both of these vitally important programs are on unsustainable paths,” said economist Robert D. Reischauer, one of two independent public trustees overseeing the annual reports. The window for action “is in the process of closing even as we speak,” said his counterpart, Charles Blahous III, also a prominent economist. Social Security provides monthly benefit checks to about 57 million people, including 40 million retirees and their dependents, 11 million disabled workers and dependents and 6 million survivors of deceased workers. Medicare covers nearly 51 million people, mainly retirees but also disabled workers. If the funds ever become exhausted, the nation’s two biggest benefit programs would collect only enough money to pay partial benefits. Social Security could cover only about 75 percent of benefits, while Medicare’s fund for hospital and nursing rehabilitation care could pay 87 percent of costs. With 10,000 baby boomers turning 65 every day, America’s aging population is straining both programs. While the combined Social Security fund was projected to be depleted in 2033, the trustees warned that the threat to one of its component trust funds that makes payments to workers on disability is much more urgent. They projected that the disability trust fund would deplete its reserves in just three years, in 2016. That date is unchanged from last year’s report. Blahous said he hoped that would prod lawmakers to act on the broad challenges facing Social Security. 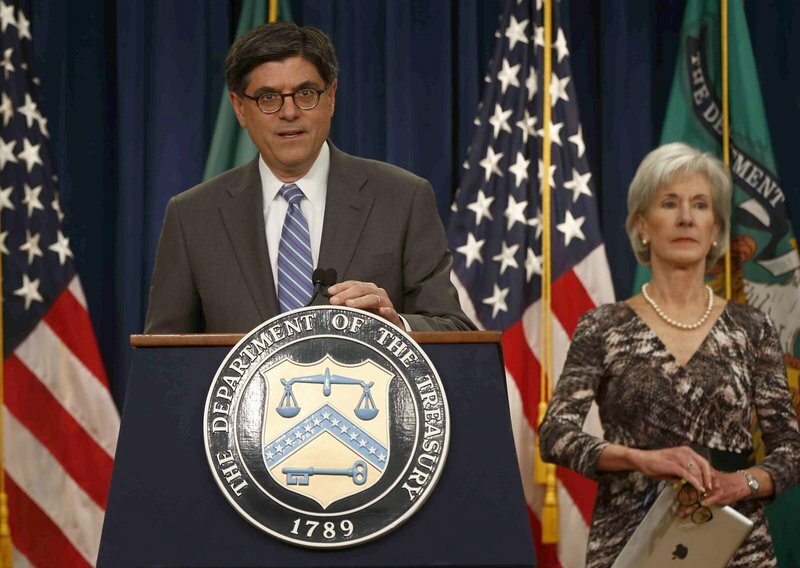 The remaining trustees are senior administration officials, including Treasury Secretary Jacob Lew and Health and Human Services Secretary Kathleen Sebelius. While acknowledging the need for long-term changes to improve program finances, they used the occasion of the annual report to assert that Obama’s policies are working, particularly his health care overhaul. Motivation for both sides to tackle federal spending deficits — always risky because of the pain that could cause voters — has already declined because the improving economy has also pushed projected federal deficits downward. This year’s shortfall is now expected to be $642 billion, down from $1.1 trillion last year. Obama has proposed significant changes to both benefit programs, in the context of budget talks. Those include a formula change that would pare cost-of-living increases for retirees, and nearly $400 billion in Medicare savings, mainly from cuts to service providers. Congressional Republicans want to do more, particularly on Medicare, by converting the program into a private insurance system. Social Security is financed by a 6.2 percent tax on the first $113,700 of workers’ wages, paid by both employers and workers. Congress temporarily reduced the tax on workers to 4.2 percent for 2011 and 2012, though the program’s finances were being made whole through increased government borrowing. Blahous said if Social Security’s shortfall were to be fixed immediately by boosting the payroll tax alone, that rate for workers and employers together would have to be increased from its current 12.4 percent to nearly 15.1 percent. If action were delayed until 2033 — the year of insolvency — the tax would have to rise to 16.5 percent. If the savings were to come only from reducing benefits and were made immediately, the benefits would have to be cut 16.5 percent for both current and future recipients. Targeting future beneficiaries alone would mean benefit cuts of nearly 20 percent. Waiting until 2033 to impose the changes would mean benefit cuts of 23 percent for current and future recipients. If cuts were limited to future beneficiaries, even wiping out all of their benefits would not close the shortfall, said Blahous. “The window of opportunity to deal with Social Security closes well before the early 2030s,” he said. Not all the news was bleak. The trustees projected a 2 percent Social Security cost-of-living increase for 2014. And the monthly Medicare Part B premium for outpatient care was projected to remain the same as this year. That’s generally $104.90, although upper-income retirees pay more. The good news for Medicare may not last. The program’s future costs are difficult to estimate, subject not only to economic fluctuations and the aging society but also to the impact of the latest drug or technological breakthrough. Nonetheless, the trustees said the overall slowdown in health care spending is providing relief for Medicare. It was the main reason for extending the life of the trust fund by two years. The report said there was a particularly sharp drop in spending on nursing home care. Medicare pays for limited nursing home stays while patients recuperate from hospitalization. Also cited were reductions in payments to popular Medicare Advantage plans, the private insurance alternative within the program. About 1 in 4 Medicare beneficiaries are in such plans, which offer lower out-of-pocket costs usually in exchange for limitations on the choice of hospitals and doctors. The plans had once been overpaid when compared to the cost of care in traditional Medicare, but Obama’s health care law cut back those payments. Public trustee Reischauer, who specializes in health care economics, said he’s hopeful and cautiously optimistic that the slowdown in health care costs will continue. But the top Republican on the Senate Finance Committee, Utah Sen. Orrin Hatch, said the report “shouldn’t give anyone comfort” because Medicare’s slower spending reflected the country’s weak economy, even as the program faces rapidly growing numbers of recipients. “Reforming Medicare and Social Security is a national imperative that policymakers on both sides of the aisle and at the White House must embrace,” Hatch said. AARP, the seniors lobby, said it will continue to fight cuts in either program.